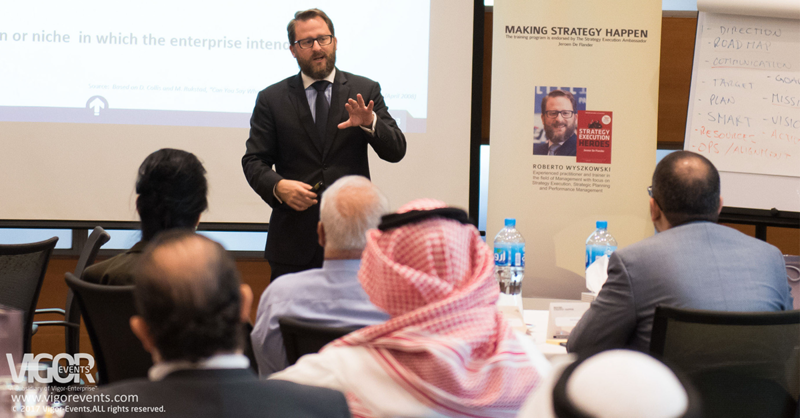 Knowledge Club’s 2017 second workshop of season 2 was a two-day session titled Making Strategy Happen on the 10th -11th of October 2017, in Hilton Hotel Mangaf in Burgan Meeting Room. Conducted by experienced practitioner and trainer in the field of Management- Roberto Wyszkowski. Composed of 5 different modules across 2 days, the program took participants through the principles of strategy definition and formulation, they will learn how to identify current challenges and how to translate them into an actionable strategy. Leaders learnt how to translate their strategy using strategy maps methodology as a key tool submerging them into the world of performance management looking beyond the Balanced Scorecard as a tool, and helping to use it as a comprehensive management framework.